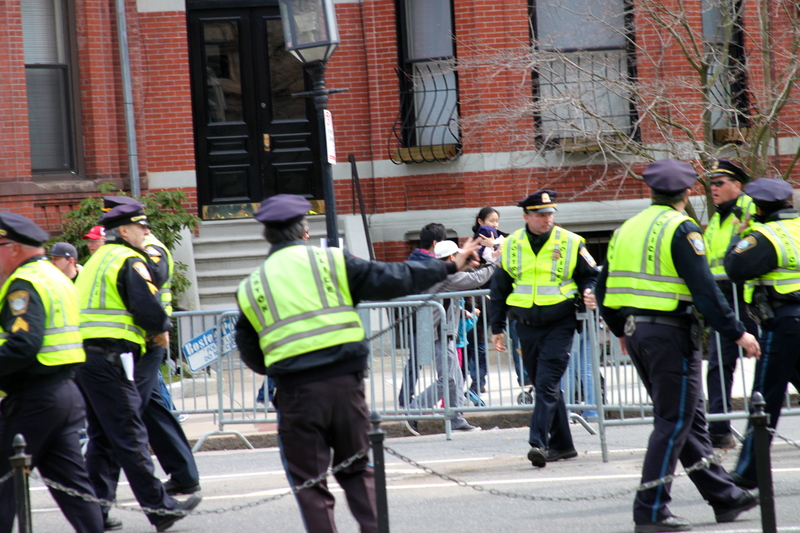 So, I was at the Boston Marathon yesterday to take pictures of my friend, Lori, running and then crossing the finish line. Before the marathon I had lunch with my daughter Em. She was nervous. "I have a bad feeling," she said. "You need to be careful." "You have no faith in me. I am a perfectly capable person." "I will be fine," I told her. But I did several things that I don't normally do. I didn't take the T. I chose to walk from Cambridge to mile 25.5 of the race route. I figured out the T route and everything, but I just didn't want to go on it. Walking was healthier, I figured. I was going to watch a marathon. So, I walked and set up for taking pictures. I didn't expect to see Lori for an hour, so I hung out with some people from New Jersey, talked to some cops. I took some pictures and kept wondering if I should walk the rest of the route to get ready for when Lori crossed the finish line. Logically, I knew I should, but my gut kept me back. One of my friends called, and as we talked the first explosion went off. "That was bad," I answered. "It was an explosion. It was absolutely an explosion." Then the second explosion happened. And I hung up. And I looked at the cops. And the cops both lifted up their portable radios to their ears. That was not a good sign. Then they began to run towards the finish line along a parallel road. That was a worse sign, especially since one of the cops looked like he never ran. Ever. I followed them. It smelled of smoke. It smelled of fear and confusion. Cops and medics and volunteers swarmed the area. Blood pooled on clothing and the ground. Debris was everywhere. People were crying and hysterical. The police turned me around. So, I turned around. I regret that now. I don't know how I could have helped. I am not a trained emergency medical technician. I regret that, too. There were cops and medics everywhere. Their shiny, reflective yellow vests were like pieces of good and brave in a smoky land of pain. I wanted to tell each of them how heroic they were. There was no time for that. They were busy saving people. So, I went back to where I had been taking pictures. Runners were wandering around still, confused, cold. They had a combination of runner's fatigue and shock. Shivering and stunned, they were desperately trying to contact family members. Some walked in circles because they didn't know how not to keep moving, but they also didn't know where to go. They had spent 25 miles moving forward, towards this one destination called the finish line and now they were stuck, aimless. Their ultimate goal was suddenly gone, devastated by two bombs. Those of us who were there to watch gave them our cell phones so they could call family members who were waiting for them. They were waiting for them right by the bombs. We gave the runners money so they could get on the T when it worked again. We gave them our coats. "How will I give it back to you?" 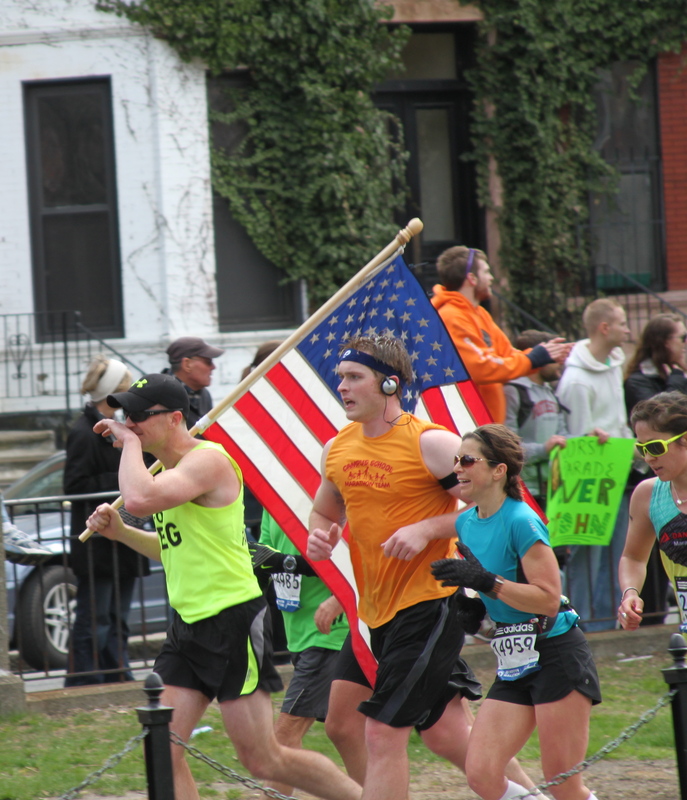 one runner asked as she shrugged on a dark green fleece. "You don't need to. You never need to," a man next to me told her. "I have to," she murmured. "I have to." One woman said, "Please tell me it wasn't the subway. My kids are on the subway." "It wasn't the subway," I tell her. "It was the finish line." She cocked her head. "What? No? How?" That was the question: How? We knew by then that it was probably a bomb, and the hows of making a bomb are easy, but the 'how could you" is a harder question. How could someone kill runners and spectators? How could humans ever think it's OK to hurt each other? How could anyone commit violence in big acts with bombs or small acts with fists. "How?" she kept saying. "How?" 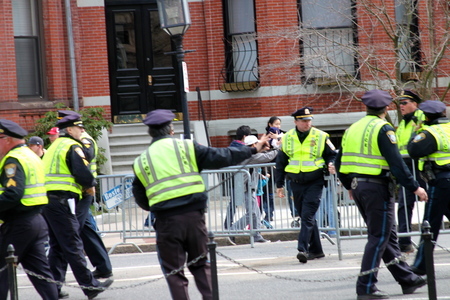 And then the police moved the runners out, detouring them down another street. And then they told us, the watchers, to go. So, we left, a massive exodus towards the bridge and Massachusetts Avenue. People were still sobbing. A man on a corner was reading from Boston.com on his iPhone trying to find out exactly what happened. People stood around him, strangers listening to him say the words, "explosions... injuries..."
"They are so hurt. They hurt them. They are so hurt," one girl kept repeating. We kept walking. As I walked across the bridge, a woman on the phone sobbed to her friend, "It was so big. The explosion was so big. I dropped everything in my hands. I dropped my lens cap. I dropped my purse. I dropped it all. I called my sister. I called my friend. I called everyone. I just need to talk to someone. I feel so alone. It was awful. People were missing their legs. It was awful." I made sure that Lori's husband and daughter were OK even though they'd been waiting right across the street from where the bomb exploded. They were. I knew Lori was OK already because I had been tracking her route. I'd never been so happy that she was running hurt and that was making her slower than normal. As I was feeling thankful, a man in front of me went down on his knees on the sidewalk. It looked like he was praying, but he was really sobbing. We all stopped walking. People pat his back. People murmured things. He stood up and we kept walking again. We walked and walked and gradually the crowd thinned, and gradually the sobs lessoned. But the sirens? The sirens grew louder and more continuous. They were forever sirens. They did not stop. And so many people helped others, making tourniquets out of yarn, carrying the injured, soothing the shocked, giving away their clothes to keep runners warm. And so many people have hearts of goodness. We can't forget that. Not ever. Not in Boston. Not ever. Because that is exactly what the Boston Marathon is about: It's about not giving up, not giving in to pain. It's about that celebration of surviving and enduring against all odds, against everything. It's about humanity. No bomber can take that away. Not ever. This post originally appeared on Carrie Jones' Livejournal.